This morning saw the beginning of the World Future Society 2014 annual conference: WorldFuture 2014: What If in Orlando, Florida! WorldFuture 2014 is a collective of some of the world’s most inquisitive and dedicated scholars, asking about the future of a myriad of topics including humanity, government, education, religion and even happiness. Speakers will include Paul Saffo of Foresight at DISCERN, Stacey Childress of the Bill and Melinda Gates Foundation’s investment in K-12 Next Generation Learning, Lee Rainie of the Pew Research Center’s Internet and American Life Project and many more! You can keep up with the conference on Twitter by using the hashtag #wfs2014! In honor of the conference, we’re pleased to bring you the top five most read articles from World Future Review. “Peer Production and Prosumerism as a Model for the Future Organization of General Interest Services Provision in Developed Countries: Examples of Food Services Collectives” by Katarzyna Gajewska from March 2014. “Geothermal Energy” by Gioietta Kuo from February 2012. “Higher Education in the Future Tense: Taking Futuristics to School” by Arthur B. Shostak from March 2014. 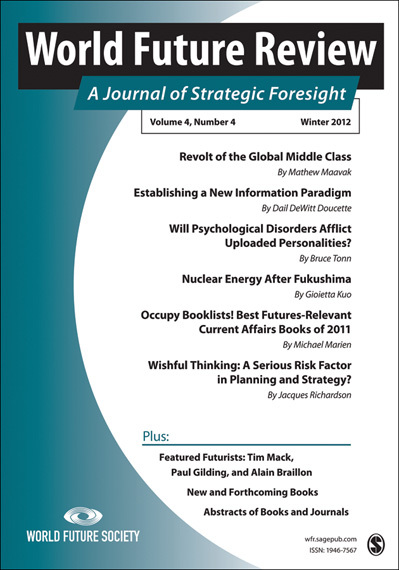 Want to know about all the latest news and research like this from World Future Review? Click here to sign up for e-alerts!